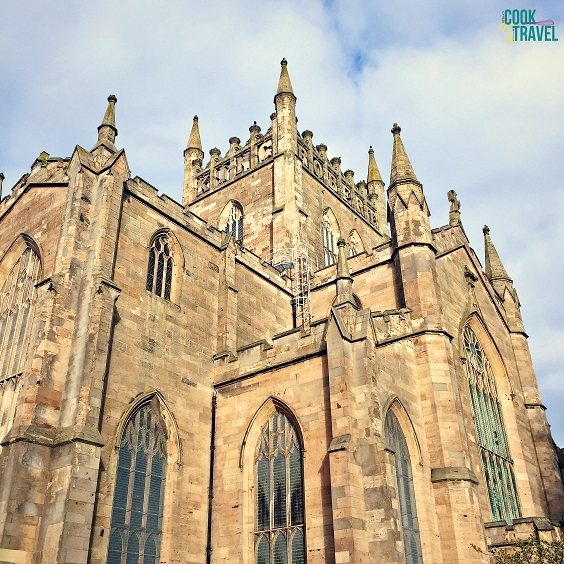 A couple of weeks ago I talked about the tour company we used when we visited Scotland. My sister and I were there for 3 full days, and we decided we wanted to get out and see the country by going on day trips. 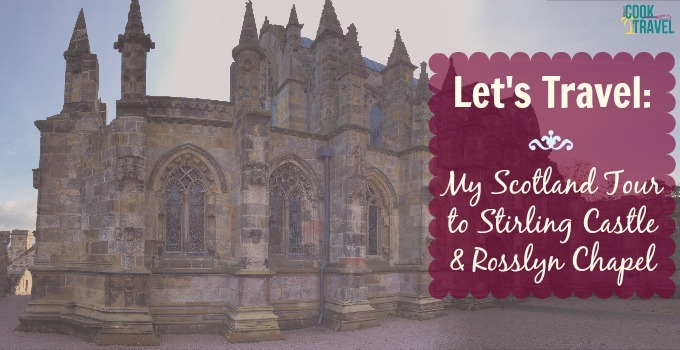 Our first Scotland Tour was a day trip to Stirling Castle and Rosslyn Chapel, among other places. I actually think this was the perfect tour to take our first full day there. It was several hours long and we saw tons of stuff. But we also got back to Edinburgh with plenty of evening left to walk about, grab dinner, and enjoy the city. So let’s talk Tour 1 a bit. Our tour guide took us to so many cool spots. Because we had a small group (it was the end of the tour season there), we had a lot of flexibility on how long we stopped at places. This is Forth Rail Bridge not too far out of Edinburgh. I love how the mist of Scotland adds this eerie-ness and air of mystery. Our first stop out of Edinburgh was a quick look at the Forth Bridge. 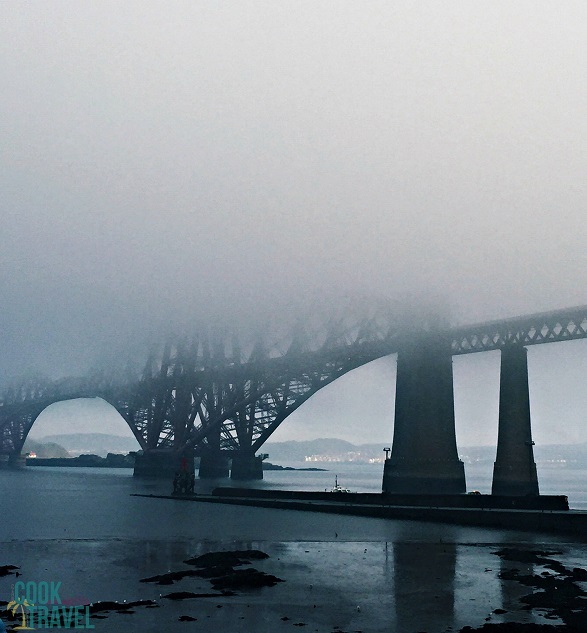 It’s a railway bridge over the Firth of Forth that has been in use since 1890 and is seriously cool. And it was particularly neat, since the mist had settled in and gave the bridge a bit of an eerie look. Then off we went to Dunfermline Abbey. This abbey has been around since 1250. Seriously!! Now this is why I LOVE going to Europe. The history and age of the buildings there are incredible, not to mention how stunning they are. I love walking through locations thinking of all of the people that have walked in that same spot. Too cool! Dunfermline Abbey was actually pretty close to my heart. You may recall I mentioned my Scottish roots and that I’m related to both William Wallace (aka – Braveheart) and King Robert the Bruce. Well this spot was important for both of these men. If you’ve seen the movie Braveheart, then you know that William Wallace didn’t exactly die in a peaceful way. I’ll spare you the details, but the Scots weren’t able to bury Wallace. So one way they pay their respects is by visiting the grave of his mother, whose grave is marked by a Hawthorne tree in the cemetery next to the abbey. Notice how the tower says “King Robert” at the top. The other sides say “The Bruce” – love that tribute! As for Robert the Bruce, the abbey certainly commemorates this heroic king. The tower of the church has “King Robert the Bruce” written out around the tower. Robert the Bruce is also buried in the abbey as well, so seeing his grave inside the church was a cool surprise. Plus you have the ruins of the cathedral from the Reformation on the grounds as well. There’s so much to see for the history buff. Stirling Castle sits atop a large hill (as any good castle should) overlooking Stirling, Scotland. And it’s totally worth visiting for the view alone. Talk about stunning and picturesque. This photo I took seriously looks like it’s fake, but’s really that lovely. 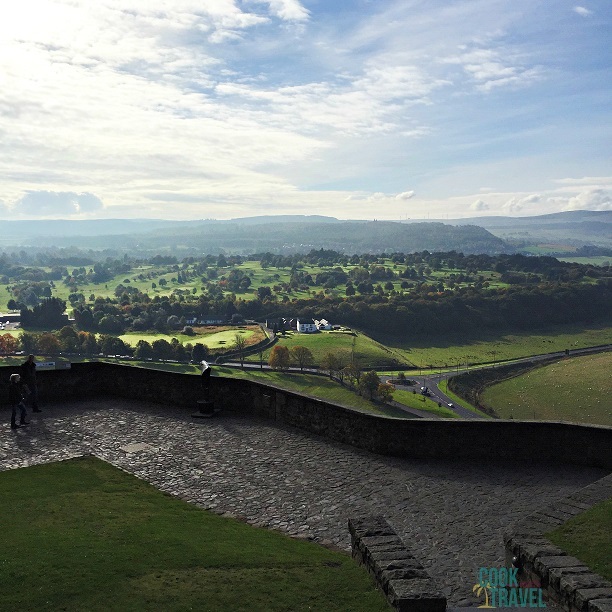 Could this view from Stirling Castle be more stunning? And yes, I took this picture – it’s real, which is hard to believe because it’s so beautiful. This is just a taste of the scenery that Scotland has to offer. When you visit Stirling Castle be sure to take the guided tour. Our tour guide was delightful and absolutely passionate about his job and this castle. You could tell that he loved what he did! I’ll admit I was most excited about the fact that Mary Queen of Scots lived in Stirling Castle for many years. As someone who thoroughly enjoys the show Reign on the CW network about Mary Queen of Scots, well I was kind of in awe as I walked through the palace to see where she and her family lived. Too freaking awesome! Stirling Castle sits atop a hill over the city of Stirling. Here you’ll see 2 of the many buildings that are part of the castle complex. This castle was of great importance to the Scots over the centuries. They say that whoever was in control of Stirling Castle ruled Scotland, so it has seen a lot of battles and kings and queens on this site. It’s certainly worth seeing when you visit Scotland. 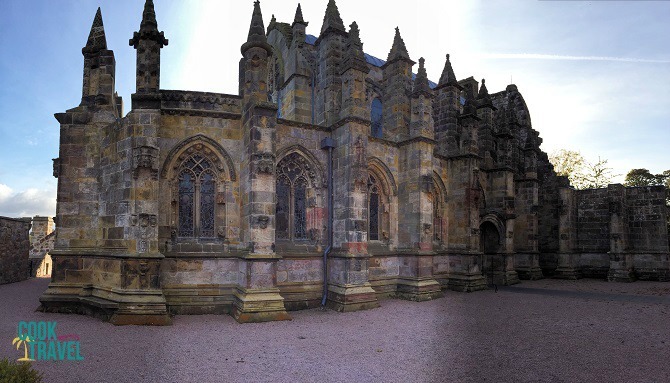 Our last big stop of the tour day was to visit Rosslyn Chapel. Now if you’ve seen The DaVinci Code then this chapel is definitely one you’ll recognize. It’s the final stop of Tom Hanks’ exciting journey in the film, and is one stunning little place. This chapel was founded by the St. Clair family in 1446 as their family chapel. It is an intricately decorated chapel with TONS of symbology. The art historian that I am was absolutely delighting in the neat stories with every turn. 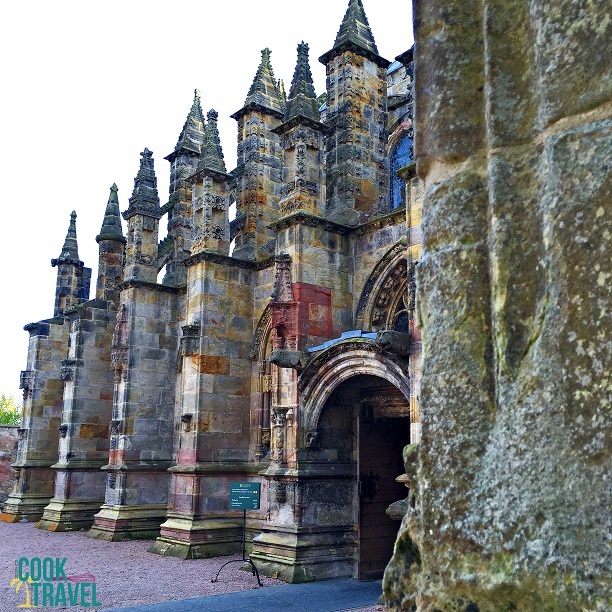 Rosslyn Chapel is a special place steeped in history and was built right in 1446 … before Columbus found America! So cool! Walking around the visitor center was fun, and the gift shop was packed with lots of goodies. The center has a cafe and some neat interactive technology about the history of the chapel. Plus the visitor center is a modern facility with tons of windows, giving awesome views in the coffee shop. And if you love architecture, a walk around the grounds of the chapel will be a true delight! I just love the architecture of this chapel! 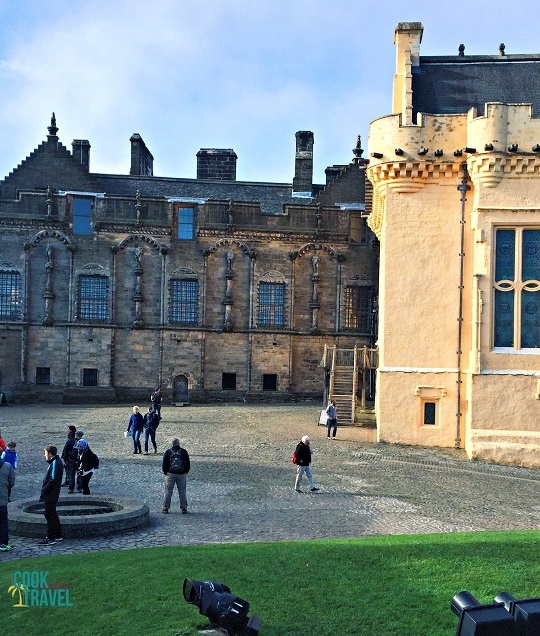 I hope you enjoyed this overview of our day trip to Stirling Castle and beyond. It was a really fun day with the Highland Experience touring company, and one I would highly recommend. Stay inspired & explore this gorgeous planet! Previous Post: « Gingerbread Loaf = Holiday Perfection!